One common call we get on helpdesk is when a user goes to start the Publishwave Server and gets a message that the system was locked. 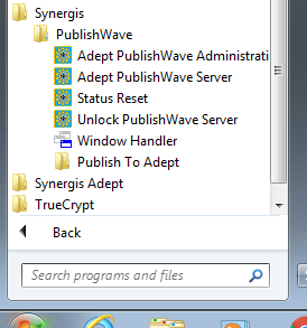 To fix this issue, you will want to go to your Start Menu and then to Synergis and then to Publishwave. Choose the Option to "Unlock Publishwave Server"
I keep this link on the desktop of our Publishwave workstation, as sometimes the workstation is rebooted without shutting down the PW server first Great tip! Also, the P2A service should be set to Automatic (Delayed Start), or else it will not check in files!